1. What causes concrete to sink? 2. Can all concrete be lifted? 6. What are the pros of concrete lifting versus replacement? 7. How long does it hold up? 8. What is a void? 9. Is B&B Concrete Lifting seasonal? 10. Do I need to be home when the estimator comes? There are a number of issues that can cause concrete to sink. The most common of these are ground settling, rodents burrowing, erosion, improper ground preparation, and roots. 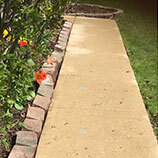 Offsets or tripping hazards are created when concrete slabs sink. 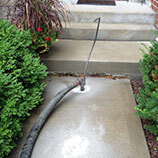 Concrete can develop improper pitch, which means the water is draining to the wrong location. Serious foundation and structural damage may result from improperly pitched concrete. At B&B, we understand how to correct these issues. Most concrete, if it is still in decent condition, can be lifted. 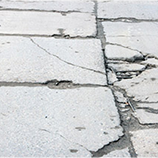 If large areas of concrete have deteriorated or crumbled, or if fractures are too close together, replacement may be the best option. 3. Can cracked concrete be lifted? Yes it can. If the concrete slabs are still in large pieces, and the cracks are not located closely together, there should be no problem with lifting and leveling it. Generally, concrete lifting will save you about 50 percent on what it would cost to have it replaced. Most concrete lifting jobs will be completed in a day or less, with many projects taking only a few hours. With proper drainage and sealing, lifting can last indefinitely. B&B offers a two-year guarantee on all of our work. It is a pocket of air or water beneath the concrete. 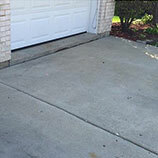 We can fill the void with material to better stabilize your existing concrete. Our material is mixed with water and pumped through hoses, so it is vulnerable to problems associated with freezing conditions. We are operational between the months of April and November. No. If you’re not home, we can leave the quote in a screen door or mailbox. We can also send it to you via email or through Facebook. If you need concrete lifting or repair in the St. Charles/Fox Valley area, please contact us right away!